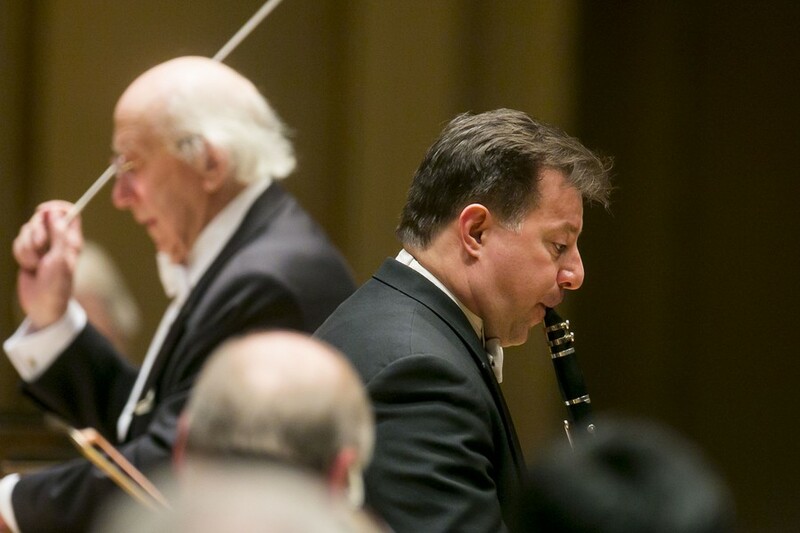 CSO Principal Clarinetist Stephen Williamson comes to the fore with Mozart’s Clarinet Concerto, led by substitute conductor Gennady Rozhdestvensky (in back). Last Tuesday, the Chicago Symphony Orchestra (CSO) unexpectedly announced that music director Riccardo Muti had suffered a “minor accident” after the CSO’s recent Asia tour, necessitating hip surgery and withdrawal from two weeks’ worth of concerts. The unfortunate news means that Chicagoans will have to wait until April to see Muti in action, provided his recovery goes smoothly. As far as last Friday’s concert is concerned, however, the maestro’s absence offered one hell of a silver lining: 84-year-old Russian conductor Gennady Rozhdestvensky, who led an all-Shostakovich program earlier this month. Rozhdestvensky’s last-minute substitution resulted in only one program tweak: the replacement of György Ligeti’s ghostly Ramifications with a lesser-known Sibelius chestnut, Rakastava. The swap retained the program’s string-orchestra emphasis, with Mozart’s Clarinet Concerto—featuring the CSO’s own superb Stephen Williamson—as the sole outlier. Rakastava makes up for its occasional clunkiness with sparse, simple emotiveness. Perhaps that’s why it was the darling Sibelius just couldn’t kill. The program notes mention the composer’s obsessive reworking of his early opus: beginning as an 1893 piece for unaccompanied men’s chorus, it evolved through versions for men’s chorus and strings and mixed chorus. Its final iteration, from 1911, stands as a completely instrumental work for string orchestra and limited percussion. Personally, I disagree with the program notes’ assertion that Rakastava’s “true brilliance” blossomed once Sibelius abandoned vocal writing—and with it, the source texts from the Finnish Kanteletar—in favor of strings. Luckily, the CSO and Rozhdestvensky succeeded in making an otherwise unremarkable piece compelling. In spite of its small ensemble size (or perhaps because of it) the orchestra produced a sound of extraordinary depth and acuity. Next up was Williamson’s solo spotlight in Mozart’s Clarinet Concerto. His interpretation showcased the warmth of tone so recognizable in his orchestral solos. While not necessarily breaking any interpretive ground, Williamson impressed with his vivacity and well-grafted cohesion with the ensemble. “Perseverance” is another adjective that comes to mind. During the third movement, escaping air whistled audibly from Williamson’s clarinet, an issue that clearly vexed him. He fidgeted with a misbehaving valve at every opportunity; unfortunately, opportunities are too few and far between in the inexorably flowing Rondo for the soloist to so much as change out a reed or swab the instrument. To his credit, Williamson finished strong: it was an altogether delightful offering from a musician who never fails to delight. In its first-ever CSO performance, Arvo Pärt’s Orient & Occident brought the program back into string orchestra territory. True to its title, Orient & Occident brilliantly layers languid, harmonic-minor modalities that recall the Middle East over a bedrock of Western harmony. Contrary to recent CSO premieres I’ve heard, the ensemble sounded assured and nuanced in its interpretation of Pärt’s ethereal 2000 piece. During Friday’s performance, Orient & Occident’s enigmatic ending of a unison A, sustained by all of the strings, which never cadenced to D, was satisfyingly hair-raising. Tchaikovsky’s Serenade for Strings was a concluding feast for the ears, richly played by the 40-piece orchestra. There were moments where one wished for a mellower, more flexible interpretation in the outer movements, but the inner movements presented Tchaikovsky at his lissome, lyric best. Though the CSO traversed a wide-ranging program Friday night, one observation was reaffirmed with each and every piece on the program: the CSO could not have arranged a better substitute than Rozhdestvensky. Eschewing a podium and, now and again, his obligation to actually beat time, the legendary conductor is nothing short of idiosyncratic. He wields an almost comically long, 20-plus-inch baton, and apparently isn’t one to take any time between movements. I was amused by his tendency to whip to the next page of the score and coolly lift his arms, ready for the downbeat, leaving the orchestra scrambling to catch up. But it’s precisely these idiosyncrasies that made for a truly remarkable evening. Rozhdestvensky was the go-to interpreter and dedicatee of works by Soviet composers like Shostakovich, Schnittke, and Prokofiev, and his expertise showed. He savored both detail and structure in equal measure; so palpable was the rapport he had with the CSO that one wouldn’t have guessed he’d been asked to substitute last-minute. Most importantly, by occasionally lowering his baton altogether, Rozhdestvensky appeared to be challenging the orchestra throughout to not only play more sensitively, but also to listen more sensitively. It certainly paid off in this chamber-heavy program: the results were nothing short of marvelous, even by the CSO’s standards. Silver lining, indeed.